Based on the highly toxic effects of Cd(II) on the aquatic environment and the human health, identification and evaluation of such pollutants is required. Efficient and economic electrodes for sensitive and selective detection of this element are very important. In this study, carbon paste electrode (CPE) modified with lanthanum tungstate ion exchanger was assembled for potentiometric assay of Cd(II) ions. The prepared sensor exhibited a Nernstian response for Cd(II) within a wide working range of 8 × 10−8–1 × 10−1 mol L−1, with a slope of 29.4 ± 0.12 mV/decade. It has been specified by a low detection limit of 8 × 10−8 mol L−1 and a short response time of ~ 5 s and can be utilized efficiently up to 22 weeks without any significant errors in the potential determination. 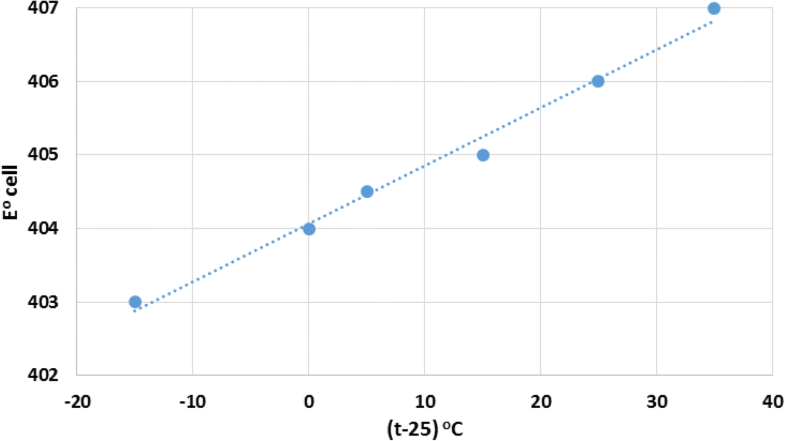 The standard electrode potentials, E°, and the isothermal temperature coefficient (dE°/dt) of the sensor were estimated at various temperatures. The obtained results indicated that the nominated electrode has efficient performance to estimate Cd(II) in its pure solutions and other various real samples (river water, plant foodstuff, industrial wastewater, nickel cadmium battery, and fish tissue samples). Due to its high toxicity, cadmium displays a trace element with high significance for efforts dedicated to ecological security (González Vázquez et al. 2016). Cadmium’s quantitative determination in environmental samples is of increasing importance, since this heavy metal occurs as a contaminant, and enters diverse habitats via municipal and industrial waste streams. Exposure to cadmium and its compounds through inhalation, food, drinks, and smoking severely impacts the human cardiovascular (Larsson and Wolk 2015), renal (Osawa et al. 2001), gastrointestinal, neurological, reproductive, and respiratory systems (Friberg 2017) and even leads to several types of cancer in humans (Nawrot et al. 2010). Cadmium is widely utilized in electroplating, nuclear reactors, some industrial paints, and nickel-cadmium batteries. Reliable estimation of Cd(II) is extremely important because of its poisonous nature. In addition, cadmium has many radioisotopes along with 109Cd: its half-life of 462.9 days and decays by electron capture to 109Ag with 88.03 keV emission gamma photons. This isotope is used as calibration source for X-ray and gamma spectrometry. 109Cd is accelerated based on the nuclear reaction 109Ag(p, n) → 109Cd (Sheha et al. 2013). Moreover, cadmium is used in reactors with other components as rods for controlling and shields for neutrons absorption. Various isotopes including 113mCd can be produced (Boffie et al. 2012). 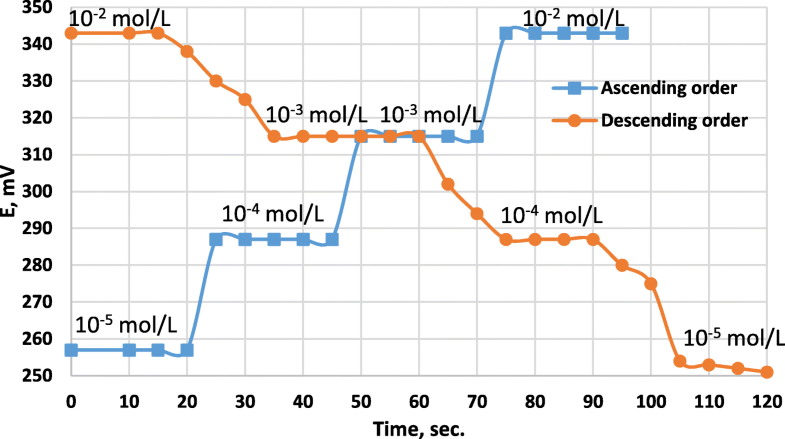 Inductively coupled plasma mass spectrometry (Dehairs et al. 1987), flame atomic absorption spectrometry (Afkhami et al. 2006), electro thermal atomic absorption spectrometry (López-García et al. 2013), spectrophotometric (Ullah and Haque 2010), atomic fluorescence spectrometry (Wen et al. 2009), differential pulse polarography (Taher 2003), and high-performance liquid chromatography (Yang et al. 2005) are various instrumental methods used for estimation of cadmium ions. All these methods suffer from one or more major drawbacks like complexity, high cost operation and requirement for well-controlled experimental conditions (Hamed et al. 2015). Application of ion-selective electrodes (ISEs) continues to be an interesting area of analytical research. The potentiometric method for quantitative estimation of cadmium ions is the most appropriate technique for this manner. Potentiometric method includes some advantages such as high sensitivity, high selectivity, low cost, and rapid determination. Comparing with the conventional PVC polymeric membrane electrodes, potentiometric carbon paste electrode (CPE) has unique characteristics such as convenient preparation, renewable surface, reaction stability without internal solution, and low ohmic resistance (Zhang et al. 2012). 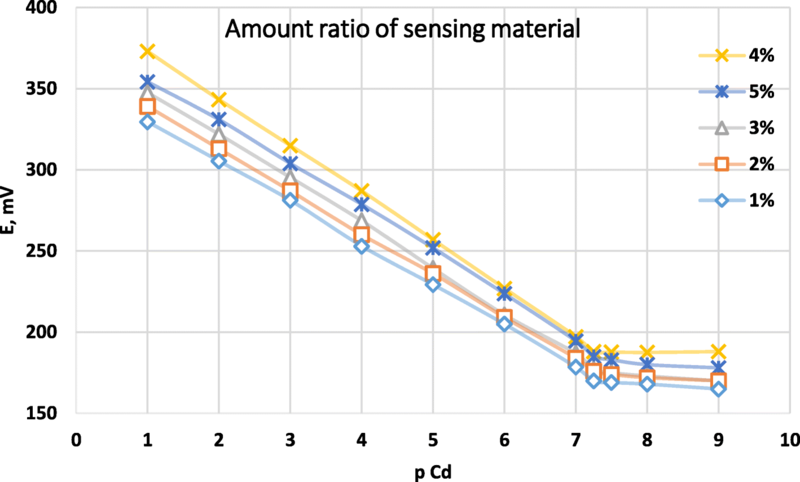 Over the past years, various sensors designed for estimation of Cd(II) have been developed to suffice a request for Cd(II)-selective measuring devices, which reliably enable the potentiometric monitoring of cadmium ions in samples of various sources (Rezaei et al. 2008b). As a major drawback of reported developments, the powerful share of these electrodes show at least one of the subsequent frequently observed blemish: limited linear range of concentration, insufficient stability, lack of selectivity, inadequate range of working pH value, and substantial influences of other metal ions. The principle motivation behind this work was to develop and describe a Cd(II)-CPE sensor based on lanthanum tungstate ion exchanger as an ionophore for efficient determination of Cd(II) ion in different real samples. The suggested electrode was utilized to detect Cd(II) in aqueous media through different operating factors, namely the kind of plasticizers, the amount of the sensing material, impact of diverse ions, and temperature. Analytical reagents and bi-distilled water were utilized in all tests. Cadmium chloride was provided from Merck. Lanthanum nitrate, sodium tungstate, sodium tetraphenylborate (NaTPB), and o-Nitrophenyloctylether (o-NPOE) were purchased from the company Fluka. Hydrochloric acid (HCl), nitric acid (HNO3), sodium hydroxide (NaOH), dibutylphthalate (DBP), dioctylphthalate (DOP), and dioctylsebacate (DOS) were supplied from BDH. Tricresylphosphate (TCP), synthetic graphite powder (1–2 μm), and high molecular weight polyvinyl chloride (PVC) powder were obtained from Sigma-Aldrich. To accomplish the potential determination, a Jenway 3505 pH-meter was utilized. The pH meter was connected to a reference electrode (Ag-AgCl twofold intersection, Metrohm 6.0726.100), which was associated with the suggested sensor. The Thermo-Orion 3 Stars, USA, was utilized to follow the pH. A techno circulator thermostat model C-100 (Cambridge-England) was used to control the temperature of the test solution. An inductively coupled plasma optical emission spectrometry (ICP-OES) was used to investigate the metal ions concentration in various solutions. To prepare the ionophore lanthanum tungstate, 0.05M sodium tungstate solution (200 ml) was added to 0.05M lanthanum nitrate solution (100 ml). To regulate the pH of the reaction solution, dilute solutions of HCl or NaOH were used. A gel was obtained during this process and settled to the reaction vessel’s bottom within a reaction time of 24 h. This gel was subsequently introduced to filtration, washing using bi-distillated water, and then to drying at 50 °C. 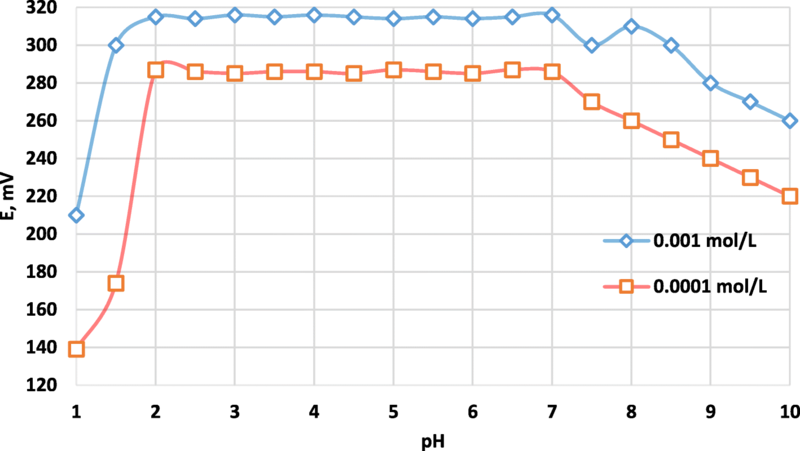 Conversion of the produced material into the suitable form was accomplished by changing the pH value of the solution (Husain et al. 1982). Here, I represent the initial cation quantity in the aqueous phase, F describes the final cation amount in the solution, V is the solution’s volume (mL), whereas m expresses the mass of cation-exchanger (g). The produced ion-selective sensor was prepared by blending the appropriate quantities of highly pure graphite powder, lanthanum tungstate, and solvent mediator. This mixture was carefully blended in the mortar. The produced sensing carbon paste was introduced into the electrode body. The surface of the paste was swept by a piece of paper to obtain a perfect smooth surface. After the designing process, the sensors were put in a dry and cold place until utilization. Unmodified electrode was prepared in a comparable way without incorporation of lanthanum tungstate in graphite powder and immersed in the fresh prepared solution of 10−4 mol/L Cd(II) (Aglan et al. 2014; Aglan et al. 2012). The performance of the modified CPE was evaluated compared with ICP-OES by determination of Cd(II) in several actual samples including river water, industrial wastewater, plant foodstuff (carrot), rechargeable batteries waste (nickel-cadmium battery), and fish tissue. Whatman filter paper no. 40 was used to filtrate the collected samples of wastewater before the analysis process. 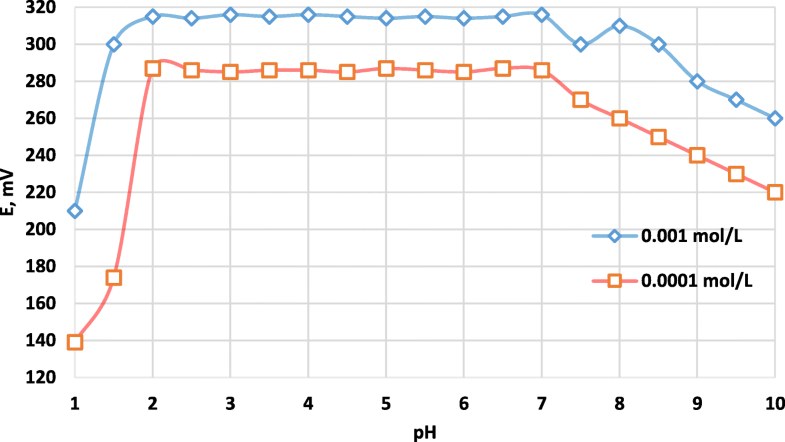 Diluted solutions of HNO3 or NaOH were added precisely to adjust the pH values of samples to achieve the desired value (Afkhami et al. 2012). Afterwards, 10 mL of this solution was released and subjected to analysis process using the candidate CPE. For examination of cadmium in fish tissue sample, the fish sample was bought from a local fish market. About 1 g of dried fish tissue was transferred into a digestion vessel before the addition of 6 mL of H2O2 (30%) and 5 mL HNO3 (70%) for complete digestion. After immediate assembling of the reaction vessel, it was slightly swirled and put into a preheated furnace at 180 °C for about 90 min. (Aglan et al. 2018). At that point, 6 mL of 1 M K2S2O8 was added, and the mixture was heated for 30 min. A while later, the processed fish sample was cured for cooling at room temperature. Finally, the pH value of the digestion cocktail was adjusted to the desired value and diluted to the proper volume by using bi-distilled water. A portion of the liquefied sample was subjected to subsequent analysis processes. The examination of cadmium in plant foodstuff (carrots) was accomplished by incineration of about 1 g carrot in at 500 °C for 6 h. By descending the temperature to the room temperature, the remaining ash was carefully liquefied by adding 5 mL of HNO3 diluted with water (1 + 1 v/v). This mixture was heated on a hotplate until almost complete desiccation was reached. The obtained residues were dissolved in 20 mL of bi-distilled water and filtrated by filter paper. The filtrate was diluted by 50 mL of bi-distilled water (Khaloo et al. 2012). Aliquots of the solution were introduced to the proposed methodology for Cd(II) investigation. Moreover, Cd(II) was introduced to further determination in rechargeable batteries by using spent Ni-Cd battery. The spent batteries were collected and dismounted in the different parts of the cell including the steel case, cathodes, polymeric separators, and dynamic cell material. After digestion, treatment, and liquefaction, the pH values of the sample solutions were adjusted to the required value as reported in literature (Reddy and Priya 2006). Then, the cadmium concentration was evaluated using the developed CPE sensor. A lanthanum tungstate cation-exchanger was prepared for using in preparation of selective CPE aims to qualify the selectivity of this innovative electrode towards separate cations. In this manner, distribution coefficient (Kd) of lanthanum tungstate cation exchanger towards different metal ions was determined in different aqueous media as illustrated in Table 1. Based on the reported values of Kd it is clearly observed that Cd(II) is strongly adsorbed from all investigated aqueous media. On the other side, other twenty cations have showing low Kd values according to their weak adsorption. The superior isolation of Cd(II) from various examined media confirmed the efficiency and selectivity of exchanger material for this element and demonstrated characteristic adsorption and ion selectivity. Therefore, it can be concluded that lanthanum tungstate displayed high selectivity for cadmium and can be designated as an appropriate sensing material in the preparation of Cd(II)-CPE. The ISE response is attributed to the electron-exchange mechanism at the membrane- contact interface and ion exchange at the membrane-solution interface (Bailey 1980). The quantity of the sensing electrode material (ionophore) is one of most significant imperative parameters affect the performance of potentiometric sensors. The importance of quantity is due to the quite influences on the efficiency of sensors despite their selectivity and detection limits. Therefore, the performance of developed CPE was investigated due to the impact of the quantity of the sensing material at different ratios (1%, 2%, 3%, 4%, and 5%) relative to o-NPOE as a solvent mediator. Figure 1 is showing the calibration diagrams and indicating that the best performance was achieved in the case of using 4% of the sensing electrode material as it gives the closest slope to the Nernstian value (29.4 ± 0.12 mV/decade) in a linear range (8 × 10−8–1 × 10−1 mol/L), and the lowest limit of detection (LOD) (8 × 10−8 mol/L). Accordingly, 4% lanthanum tungstate was the optimum ratio suitable for the preparation of the modified electrode used in the following experiments. 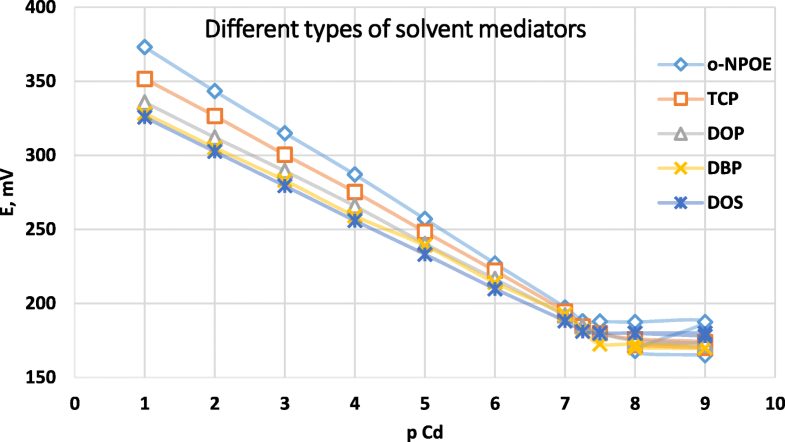 Various solvent mediators (o-NPOE, DBP, DOP, TCP, and DOS) were introduced to potentiometric determination, and the acquired results were presented in Fig. 2. The subsequent calibration diagram was applied to assess the potentiometric performance of the CPE for various solvents by determining the Nernstian response, linear domains, and LODs. Moreover, the CPE’s life span can be expected for the most appropriate CPE. The results revealed that o-NPOE is the most suitable solvent mediator for potentiometric determination of Cd(II) ions in aqueous solutions. This outcome agrees with the normal pattern of affectability from the dielectric consistent estimations of these plasticizers (Ali et al. 2014). The most elevated affectability was acquired by using o-NPOE (dielectric consistent = 24) as solvent mediator. In view of the above result, o-NPOE is recommended as solvent mediator in the case of using CPE sensors for determination of Cd(II) ions. 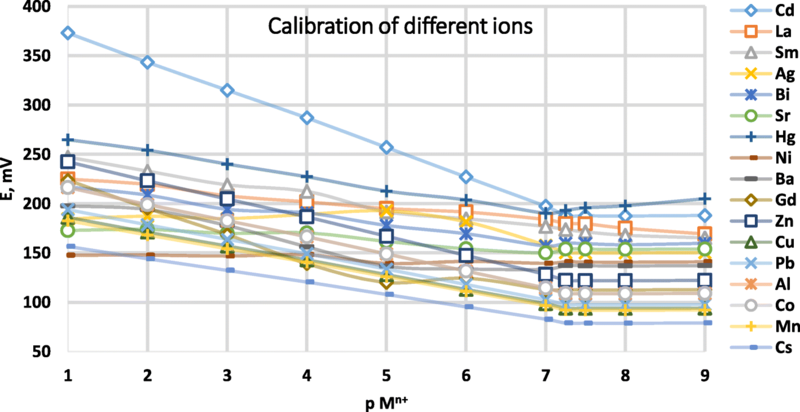 In order to investigate the effect of hydrogen ion concentration on the response behavior of the modified Cd(II)-CPE, the potentials were measured for 1.0 × 10−3 and 1.0 × 10−4 mol L−1 of Cd(II) ions in different solutions of different pH values (1–10). As previously mentioned in experimental section, dilute solutions of HCl or NaOH were used to adjust the pH value. The results conducted that the potential response remained constant within the range of 2.0–7.5 as shown in Fig. 3. However, the modified Cd(II)-CPE performed significantly in the pH range of 2.0–7.5 as a result of noninterference between H+ or OH− within this range. The fluctuations occurred at pH values less than 2 or more than 7.5 as a result of decreasing the efficiency of Cd(II)-CPE, and this behavior could be explained as due to the competition with hydrogen ion in high acidity and the formation of the soluble and insoluble Cd(II) ion hydroxyl complexes in high alkalinity (Aglan et al. 2012). Plot of E°cel versus (t − 25) produced a beeline as demonstrated in Fig. 4. The slope of this beeline was taken as the isothermal temperature coefficient of the cell. It amounts to 0.00079 V/°C. A plot of Eo electrode versus (t − 25) gave a beeline. The slope of this beeline was taken as isothermal temperature coefficient of the Cd(II) electrode. It amounts to 0.00064 V/°C. The small values of (dE°/dt) cell and (dE°/dt) electrode reveal the high thermal stability of the electrode within the investigated temperature range. Response time, reversibility, and duration of an electrode’s life are essential factors for any potentiometric sensors in analytical performance (Bagheri et al. 2016). The average response time reflects the time needed by a sensor, until a stable potential ± 1 mV of the final value of equilibrium is reached; this value was determined by successively immersing the electrode in a set of solutions of the target ion, each differing in their concentration by a factor of ten (Ganjali et al. 2009). The response time of the optimal modified Cd(II)-CPE was recorded by varying the Cd(II) ion concentration from 10−5 to 10−2 mol L−1 (Fig. 5). As a result, the electrode reached the equilibrium value very quickly after ~ 5 s.
In order to determine the electrode’s reversibility, a comparable technique was completed in the reverse order of concentrations, hence, starting with the highest concentration and ending with the lowest concentration. The reversibility of the electrode response was clearly demonstrated by this approach. However, the time required until equilibrium value was reached (~ 15 s). It was longer when starting with higher concentration than observed for the low to high concentration order (~ 6 s). This behavior can be explained by the fact that residual Cd(II) ions might still be attached to the CPE surface, which significantly occupies the free sites at the surface. Hence, the proposed Cd(II)-CPE is not able to rapidly detect those Cd(II) ions present in the majority of the solution and consequently reduced the response time. The lifetime of the modified CPE was estimated by developing the calibration diagram under optimum conditions at extended time. The lifetime of proposed CPE reached 22 weeks without critical change in slopes of the calibration diagram as shown in Fig. 6. After this period, the slope of the calibration diagram was fallen dramatically. Sets of six electrodes with best content of the sensing electrode material were prepared, and their performances were investigated in contact with Cd(II) ions to validate the reproducibility of the fabricated Cd(II)-CPE sensor. The results presented the average of slopes, detection limits, and linear dynamic ranges as 29.40 ± 0.12 mV decade−1, 8 × 10−8 mol L−1, and 8 × 10−8–1 × 10−1 mol L−1, respectively. The most essential characteristic of sensors is their selectivity controlling its utilization scope and applicability in real sample determination. “Selectivity” is known as the response of ion-selective sensors towards the target ion when interfering ions exist as mixture in the solution. 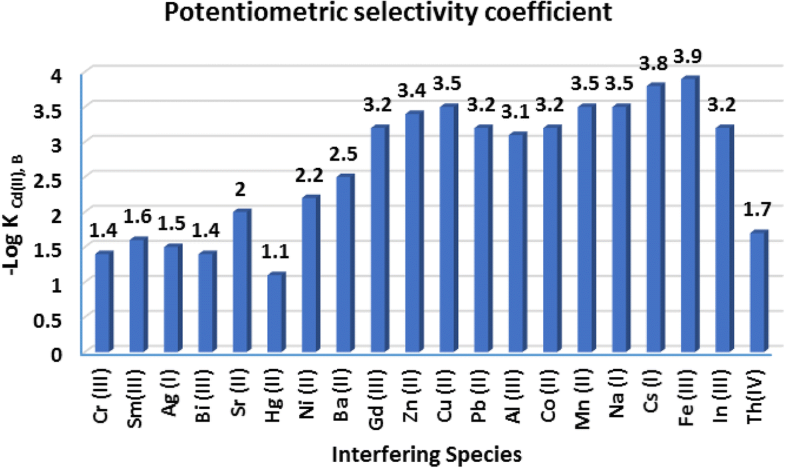 Selectivity coefficients for Cd(II)-CPE towards various inorganic cations were assessed using the “matched potential method” (Gupta et al. 2006). 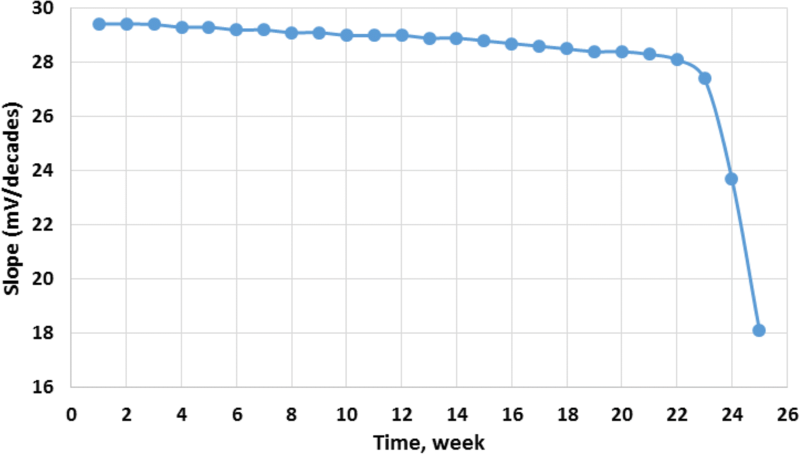 The log KCd(II), B values were measured by the MPM within the range of 10−3–10−4as presented in Fig. 7. This illustration confirmed that all tested ions cause neglected disturbance for the working Cd(II)-CPE. 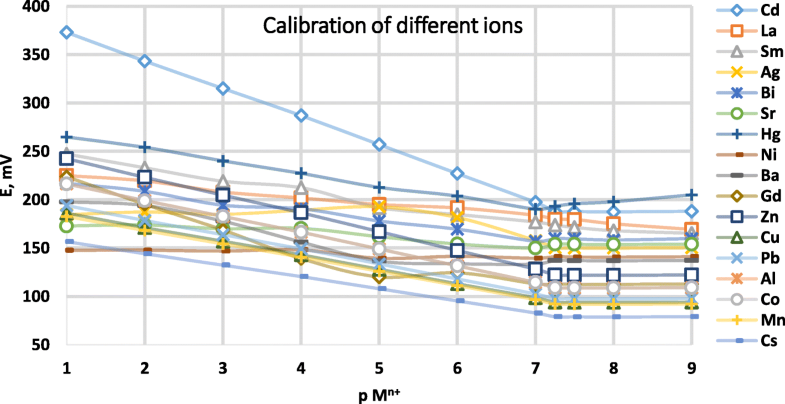 Moreover, the performance of the suggested sensor was validated at different concentrations of various cations. Non-significant distinction can be defined for slopes presented in the calibration graph of tested cations except the target cation, Cd(II), as shown in Fig. 8. Consequently, the modified sensor achieved high efficiency and proper selectivity to determine Cd(II) ions dissolved with various interfering cations. Table 2 illustrated the proposed Cd(II)-CPE and some of the previously reported sensor systems corresponding to linearity range, the Nernstian slope, the range of working pH value, response time, and service time. This comparison has clearly indicated that the modified Cd(II)-CPE sensor is favorable and that the previously reported sensors in terms of response service time and response time are the two most significant criteria characterizing ion selective electrodes (Rezaei et al. 2008b). Among the compared sensors, the modified Cd(II)-CPE sensor displayed the fastest response (5 s) and the longest durability (22 weeks). 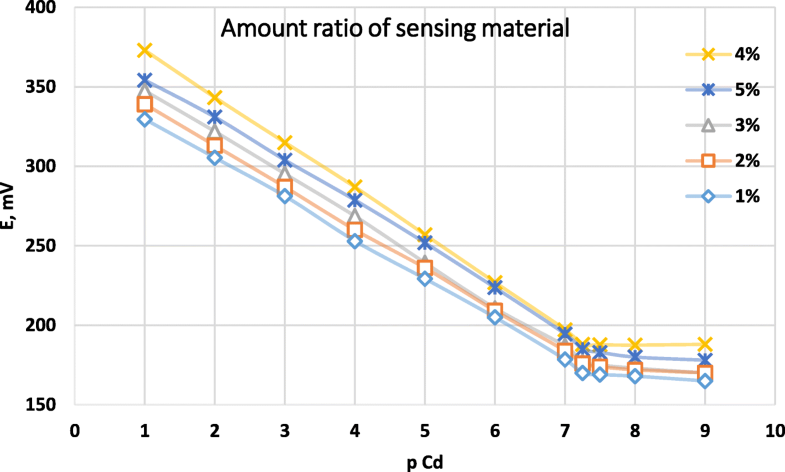 Moreover, it should be emphasized that the Cd(II)-CPE sensor performed suitably with stable performance within the extend range of pH value (2.0–7.5). As regards to its Nernstian slope, the modified Cd(II)-CPE sensor was in agreement with the other previously reported electrodes. The suggested CPE was examined to determine Cd(II) ions in broad variety of true samples, such as river water, industrial wastewater, plant foodstuff (carrot), rechargeable battery waste, and fish tissue. These samples were also analyzed by ICP-OES to evaluate the quality of the nominated electrode. The experimental data obtained by the suggested CPE were in perfect agreement with the results of ICP-OES. Table 3 illustrated the recovery values of 97.5–98.9% for the proposed Cd(II)-CPE sensor. Furthermore, the relative standard deviation (RSD) values for four replicate estimations were not more than 1.2. These values confirmed the reproducibility and precision of the suggested sensor with certainly expedient recovery values. Thus, the proposed sensor can be nominated for accurate and precise evaluation of Cd(II) ions in aqueous solutions. Calibration graphs resulting from plotting the potential values in dependence to the corresponding final concentration values turned out to be linear in a concentration range as referred to in Fig. 1. Sa reflects the standard deviation of the regression line’s intercept, b quantifies the calibration curve’s slope. The specificity was studied by detecting any interference caused by frequently occurring metal ions. As illustrated in Fig. 7, it turned out that these metal ions have not negatively impacted the results of the nominated method. To provide profound data on the proposed method’s accuracy, results of the assay for Cd(II) determination in various real samples were compared with results obtained by ICP-OES measurements. By statistical analysis of the results in terms of calculating recovery and relative standard deviations, no significant deviations in terms of accuracy and precision were observed (see Table 3). Precisions were identified using two concentrations of Cd(II) with four replicates; these tests were carried out at both inter-day and intra-day. The resulting relative standard deviations were outstandingly low (Table 4), as a clear indication of the considerable repeatability of intended method. The response characteristics of the developed carbon paste electrode were investigated and collected in Table 5. The fabricated Cd(II)-CPE modified with lanthanum tungstate was prepared for the potentiometric measurement of Cd(II) ions in several aqueous real samples. With high performance and selectivity, the suggested sensor electrode has been efficiently determined Cd(II) ions present in various real samples. The proposed CPE has many beneficial characteristics in comparison to alternative techniques, such as high performance, selectivity, and sensitivity in a vast variety of applications. Moreover, it is long-lived for more than 22 weeks and stable in wide range of pH values with high calibration graph slope. The suggested CPE was used efficiently for the estimation of Cd(II) ion in river water, industrial wastewater, vegetable food products, spent nickel cadmium battery, and fish tissue samples. The authors would like to acknowledge Dr. Martin Koller, University of Graz, Office of Research Management and Service, c/o Institute of Chemistry Graz, Austria for his excellent support in improving the language of the manuscript. RFA and MMH suggested the idea, designed the experiments, performed the data analysis, reviewed the literature, and drafted the manuscript. HMS provided useful insight into the work, provided guidance in designing, writing, and revising the manuscript and assisted with the data analysis and finally carried the publication duties. All authors read and approved the final manuscript.